In what can only be described as a tragic and horrific incident, the Occupational Safety and Health Administration (OSHA) released a statement, concluding its investigation into the death of the 31-year-old Cirque du Soleil acrobat Sarah Guillot-Guyard. The acrobat was performing in the final scene of the Cirque du Soleil Las Vegas “Ka” show in front of a live audience when the wire rope she was attached to was severed, causing the aerialist to plunge 94 feet to the floor below. The statement went on to say that Guillot-Guyard suffered multiple blunt force trauma injuries from which she was unable to recover. Furthermore, OSHA found that Cirque hadn’t trained Guillot-Guyard properly and had failed to adequately protect employees working for the show. The investigation ended with an a string of citations, which included fines issued to both the MGM Grand Hotel and Cirque in excess of $25,000 for failing to properly train and protect its employees. The loss of life in this incident is incredibly tragic, especially given the fact that there are things that could have been done to prevent it. The negative impacts of safety related incidents on business operations, employee morale and sometimes even the brand reputation of a successful organization can be catastrophic. The issues surrounding this incident are deeper than they may seem. There is little doubt that an organization like Cirque (which employs 5,000+ people) has a comprehensive training and safety program in place, particularly when you consider the heightened danger of their work. The bigger issue here is, how can a successful organization like Cirque ensure employees are actually remembering and more importantly operationalizing the training they receive, preventing catastrophes such as this one? Investing millions of dollars into bulky training programs might seem like a responsible thought but it can be as effective as throwing eggs at a wall. Most corporate (and particularly) safety training is boring, outdated and highly generalized. Safety binders collect dust, and your LMS resources might get a few views, generally only after an incident has occurred. If we have learned anything from tragedies like the one at Cirque, it’s that the one size fits-all training approach simply doesn’t work. 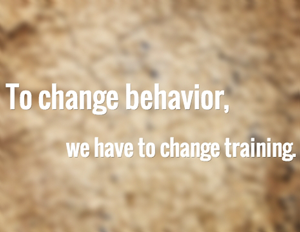 To change behavior, we have to change training. Implementing a continuous learning model that automatically measures and fills knowledge gaps is the key to having employees consistently embracing, remembering and operationalizing key safety messages and procedures. When combined with engagement mechanics such as gamification, rewards and recognition, safety training becomes more personalized and interesting, and as a result memorable. Remembering key procedures enables employees to do the right thing. Keeping critical safety knowledge top of mind on a daily basis is indispensible for any organization that wants to protect its most valuable assets, its people. When your employees are about to perform a potentially dangerous task, how do you know they will do the right thing?